Very soft fabric. The size is perfect, the color right on. I appreciate the ties in the inside to keep the comforter in place and this makes it easier to insert the comforter as well. It seems a little too warm for me, though, hence the 4 star rating. Combine comfort and style with this luxurious 3-piece duvet set from Soft Essentials. 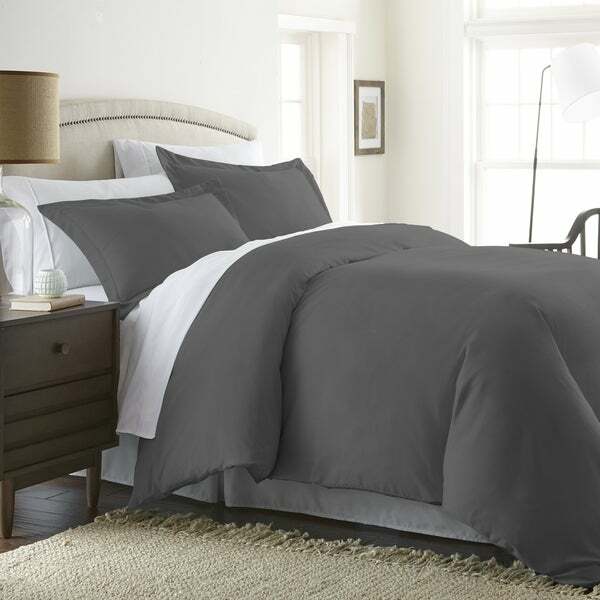 The smooth microfiber duvet wicks away moisture to keep you cool and has four corner ties to keep your comforter in place. Choose from 12 versatile color options to match your unique bedroom decor. We have only had this cover for a day so my 5 rating may be premature. However due to how soft this was right out of the bag, seams were stitched well and the bonus of no new cloth smell we thought it warranted the high rating. The cover has corner ties to keep the duvet in place which is now a new necessity for any duvet cover I purchase. My daughter loves how this duvet cover feels and the sage color was just as pictured so matches the look she was going for in her room. The material is shear with a zipper closure so time will tell how it will withstand daily use and the wear and tear of washing although I do have high hopes for this duvet cover as I have microfiber sheets that are also very shear and have held up well to many washing’s without issue. We purchased this duvet cover on sale so even if it isn’t as rugged I would definitely purchase another for both the look and feel of this set. I do wish the pillow shams were larger since we purchased the queen cover however the standard size sham will work just fine for her room. OMG this is REALLY a lovely bedspread!! We have a queen bed but I have always bought king sized quilts, blankets or spreads so that they would hand over the edge properly & getting queen size for a queen bed never worked out. Until now. I read the reviews, sorted through all my options & decided that this one time I'd take a leap based on the consistant positive reviews I read. I ordered a queen bedspread and am I glad I did! This is the 1st time I have not only a beautiful bedspread ( I ordered white) but it is plenty long on all 4 ways & hangs beautifully. It is approximately 6 inches from the floor. I don't need to pull it longer on the side of the bed facing the door thus short changing the other side. It has a beautiful embossed design and it is a nice weight. It is no way a 'lightweight' but rather substantial ( I hesitate to describe it as heavy as that sounds negative. However it IS on the heavier side, in other words it's perfect). I also boyght one sham. I'm happy with what I got but I had forgotten that I had other nice white shams that I use as well. I could have done without the one I bought but it IS lively as well. It has an envelope design on the back & the workmanship of both the sham & bedspread is perfectly donr. No hanging threads or snags. The color is a nice soft white. Not a stark glaring white & not Ivory but a nice, soft pretty white that matches up with my other white shams. I nearly ordered Ivory but am so glad I went with white. Don't hesitate to order this beautiful bedspread or sham. You will get your money's worth & you will get a quality 'long enough' bedspread! This was a fabulous find & I am thrilled with my purchase! I have always had a difficult time finding bedding that is oversized for my king size, bed with deep mattress and box springs. When I found this duvet was oversize and 116 inches wide and 98 inches long I was ecstatic. It arrived a day early along with the insert for it. I immediately owned it and took the wrinkles out of it and assembled it with the insert. To my surprise, it did drape over the bed to the top of the dust ruffle. The material is very soft; however, I am disappointed in the material as it is nothing more than or even heavier than the material sheets are made of with a zipper closure and is extremely plain looking but will serve my purpose for the time being so I am only rating it a 4. If you are someone who like a stylish bed you will need to add pillows and a throw. Since I have just received it I am not yet aware of how it will hold up after washing. Because it is very plain and a solid color any type of stain shows especially oily stains. The cover fit well and the color matches what is shown online. With all the reviews I expected luxuriously soft fabric, it is soft but it feels like a bedsheet- nothing out of this world. Still comfortable! The inside corners of the cover have ties ( two 4-6 inch sturdy fabric strands) to hold the duvet gut in place. My duvet doesn't have corner tie attachments so I had to just tie the actual corners to the cover which seemed kind of messy and insecure. I've never used a duvet before but Texas summers are pretty hot so I was attracted to the ability to change the warmth of bed covers without having to switch out comforters. This was purchased for a 14-inch thick foam mattress that is part of an adjustable bed I inherited. It reaches the bottom of the foundation but is several inches shy of touching the floor and is indeed very soft. I ordered purple and it's pretty much the color of grape juice, which I'm totally fine with. This is a good find for me again on Overstock. Let me say that I have been getting Emails from OverStock for some time, and never shopped until recently, because I needed bedding for my Queen Sized Bed. I was pleasantly surprised how fast I received my order and they emailed me when the items were put at my door, a safety feature I really appreciate. I ordered the Soft Essentials Ultra Soft 3 piece Duvet Cover Set in Purple. Somehow, it was an exact match to a purple Sheet Set I bought years ago and I love it! I put my Down Comforter Insert inside the Duvet Cover & zipped.. Its truly soft and with the shams that came with the set, It looks truly elegant on the Bed! (Especially with my sheet set and the extra pillows behind the pillows with the shams). Overstock has great prices, and for the beautiful color and quality of this set, I would buy this set in more colors! I initially purchased this to protect my new down comforter...I ordered the King Size so it would completely cover the quilt...well, it not only covers it, the duvet covers the quilt this sides of the bed and some of the floor...my error, I thought bigger would be better. I couldn't have been more wrong. I have a queen bed, the comforter is a queen but larger than the dimensions posted for the queen size set...live and learn. I ordered a second duvet in queen size. My daughter will be the recipient of the King. I have to say this is the softest duvet cover I have ever purchased. It is so very luxurious and will do the job just fine. I can't wait for the queen size to arrive next week. This duvet cover is so soft! It's easy to use and clean. I don't think it is going to last through a lot of washings. Disappointed with the quality of the material. It was made with 2 flat sheets sewn together with a zipper. The pictures don't do this item any justice. This would work better as a sheet and not a duvet. This fabric is so soft and cuddly, the shade of purple was musty eggplant which is actually QUITE PRETTY!! For the price, this duvet set is great. It's a very bright white and very soft. Extremely soft and loved it has a zipper vs buttons. It is Ok, very soft. You get what you pay for. Light weight, easy to place over comforter, washes beautifully and dries super fast. Just a pleasure to use for everyday. Color was beautiful but it could have fit a little better . returned this item only because it was my mistake ordering it. This duvet cover is really soft, which is a plus. However, it is a 96x96. I wish I would have realized this when I was purchasing...it's been hard to find a down comforter to fit inside of it. They are all too small. "If I put a printed comforter in the light grey duvet cover, will the print show through ? The print is a white background with pinks and blues floral"
I put a printed pillow into the duvet cover to check. It did show through with the darker colors. I believe the flowers would show through even if they are pastel. I have the light blue so the gray may be a little darker. "Does this duvet cover have ties in the corners so that the comforter stays in place?" The one I purchased did have ties. They are a bit short, but they do work for my down comforter. "I have an oversize king insert that is 116x98. I can't find a cover in that size. Do you think this will fit?" Judging by the stated dimensions of the duvet cover (112W x 98L), your oversized king insert may not fit perfectly. I also have an oversized comforter and is really thick, so even it fits into the duvet cover, it doesn't lay perfectly flat. This doesn't bother me as I don't tuck the comforter underneath my mattress when I fix the bed. The problem you may have is that if your insert is thin, and you want it to lay nicely flat on bed, the extra 2" on each side will "curl up". However, do note that the duvet cover offers a lot of space inside, so if you tie the four corners of the insert to the cover, you probably won't notice much of the ripples resulting from the extra 4". "Is it a velvet material?" No it is more like a 1000 thread count soft cotton. It is more of a shear material that is soft and comfortable while still being rugged. It is not velvet, but I would say it's velvety soft. 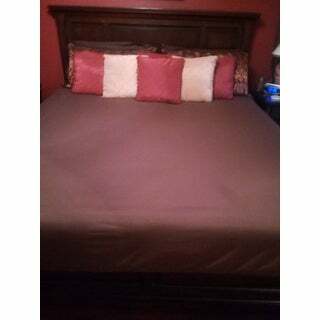 Durable, I have washed it a number of times and the duvet maintains it's shape, no shrinkage detectable. No, it's a quilted material, not velvet. "What temperature range to use this set in when camping?" This is a cover. You need a comforter insert. Mine is light down. This set doesn't actually include he comforter itself, that is sold separately. It is used year round on our bed with no insert. But remember this comforter is like two sheets sewn together w/ a closure. "What are the instructions for washing, drying, and ironing for this set?" Have not used mine yet. I wash mine on cool and tumble dry medium. I’ve used a warm iron on the shams. I add tennis balls to the dryer to assist with drying. Love this set! You can just wash and dry as you would standard cotton sheets. I would suggest pulling it from the dryer as soon as it is dry and fold or place back onto duvet. "I want a cover for a 60 x 80 weighted blanket will these work and what size would I need?" What does all three pieces include?